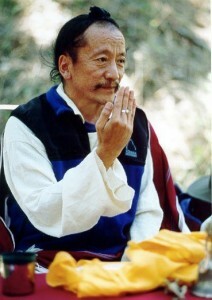 Dawa Chödak Rinpoche, or Dawa Chhodak Rinpoche (1951-2017) was a senior student of Dudjom Rinpoche, Dilgo Khyentse Rinpoche and of Kunzang Dorje Rinpoche. Lama Dawa had perfected the siddhis to do the 'divine mirror divination' (ta) practice. Through this practice, he has been able to benefit countless individuals with his abilities to see the past, present and future. He was born on Guru Rinpoche’s day near Mukhti Narayan, a sacred pilgrimage spot in Northern Nepal. After his birth, he was taken to the great mahasiddha Golok Serta Rinpoche, who recognized him as the reincarnation of Nakchu Gelong Konchok, a siddha who left handprints in the caves of Mount Kailash. Golok Serta Rinpoche made many auspicious predictions and named him Dawa Chödak, in honor of the great Buddhist masters, Chandrakirti and Dharmakirti. His older brother was Lama Pema Dorje Rinpoche. Dawa Chödak Rinpoche was raised in his father’s monastery in Dolpo, a remote region on the border of Tibet and Nepal. His father, Kathak Rigzin Dorje Rinpoche, a yogin from the Taklung Kagyü lineage, began Lama Dawa’s religious education at an early age in the traditional manner. In 1960 Dawa Chödak Rinpoche and his family relocated to Northern India where they met Dudjom Rinpoche. From the age of thirteen, he began his studies, training and practices in the Dudjom Tersar lineage under Dudjom Rinpoche. From him, he received the empowerments and transmissions of the Rinchen Terdzö, the Nyingma Gyübum, Nyingma Kama, as well as the Dudjom Tersar. Lama Dawa completed many retreats under the guidance of Dudjom Rinpoche and became one of Dudjom Rinpoche’s heart disciples, receiving all the outer, inner and sacred transmissions and oral instructions. Lama Dawa Chödak passed away in November 2017 in Nepal. This page was last edited on 27 December 2018, at 22:32.